This brief documentary combines historical research with personal testimony to illustrate the lives of several successful graduates of Washington, DC's Dunbar High School. Dunbar was a historically segregated school, nationally recognized for its excellent academic record. Its intimate connection with the faculty at nearby Howard University meant that many Dunbar students were taught by scholars at the top of their fields. 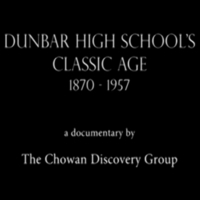 Jones, Marvin T., “Dunbar High School's Classic Age: 1870-1957,” DC Digital Museum, accessed April 22, 2019, https://wdchumanities.org/dcdm/items/show/1561.